I write to express to you my personal gratification in noting in the press yesterday the fact that you had withdrawn your consent to honorary membership in the Military Order of the Carabao. I was in Washington last week when the banquet of the Carabao was held, and read the reports as they appeared in the Washington papers the next morning with great surprise. I am sure your action in this matter and your attitude toward it meets with the hearty approval of the great mass of the American people, whatever their attitude may be on the question of granting the Philippines self government. I enclose herewith an editorial from the Ohio State Journal which is quite to the point. By the way, I may say that I had the honor of being appointed one of a committee of twentyfive to represent the committee of one thousand authorized by the national convention of the AntiSaloon League held at Columbus, Ohio, Nov. 10th, to present to you the resolution of the conference and to seek your influence in securing to the people of the United States the opportunity, which is their right, to say whether or not the constitution shall be amended prohibiting the manufacture and sale of intoxicating liquors as a beverage. We very much regretted that your illness made it impossible for us to have the pleasure of meeting you personally and presenting our petition. You will hear from the committee in writing, if you have not already done so, and allow me personally to express the hope that you will give this great question the consideration that you have proven yourself so well able to give questions that effect the interests of the entire country. Montgomery, J. Knox, “J. 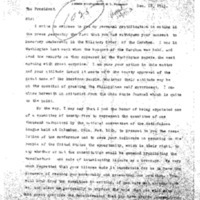 Knox Montgomery to Woodrow Wilson,” 1913 December 18, WWP18227, First Year Wilson Papers, Woodrow Wilson Presidential Library & Museum, Staunton, Virginia.